Kneale Mann | Leadership: Life and Business | What Matters Now? 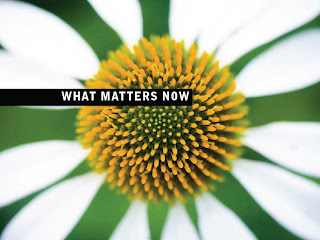 Life and Business | What Matters Now? Turn off all your electronics and surrender over all your aspirations and do absolutely nothing for a spell. Seth Godin is one of the most creative minds we have in this world. He is not curing disease or changing the trajectory of war, he makes us think and create. Seth relates to the world of business, marketing and life in an inclusive and engaging way. Be compassionate to everyone no matter the level of connection. Seth has brought together sixty people who have shared a piece of them for us to take with us and think, grow and learn. to act is to take that leap. So leap. This is not just another book of inspiration. This is not simply a group of brilliant thinkers and doers who have shared one page of wisdom each to make up a collection of ideas for our lives. This is certainly not some expensive buy-in download email laden purchase this program to help line the pockets of its creators. It was created for us to download, read, share and repeat. they were put on this earth to climb. This book is FREE. It’s FANTASTIC! This is something you need to read TODAY and OFTEN. Never forget, a small group of people can change the world. Topics include: evangelism, context, technology, knowledge, change, generosity, sleep, fascination, empathy, power, change, adventure and forty-eight more. on a small moment-to-moment basis. Sixty wonderful people have donated their time to create this 82-page free downloadable and sharable e-book. Times are tight, the Holidays are coming up, what a perfect gift to send to everyone. yet they are the roots of word of mouth.